When it rains in Mandu, it’s magical. 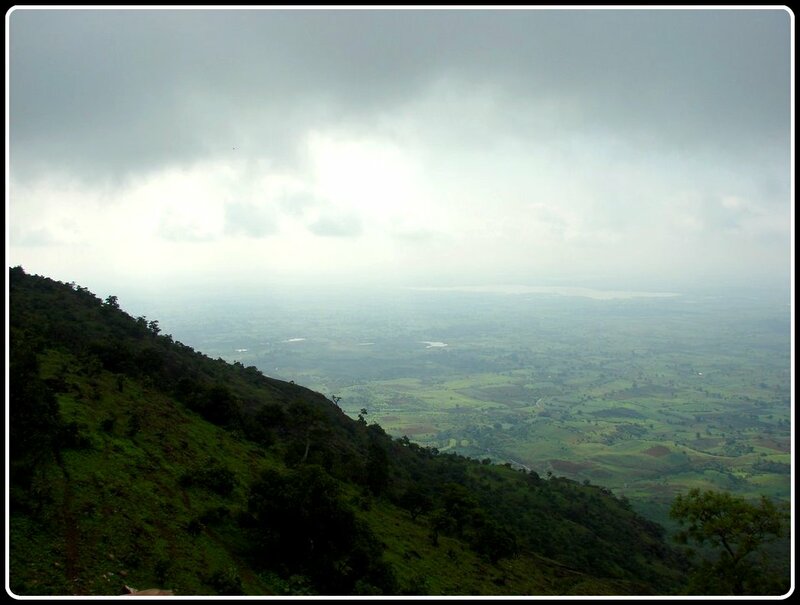 The pitter patter, the ever spatter, and the cool breeze makes Mandu, a small hamlet in western Madhya Pradesh, one of the ultimate romantic monsoon destinations in India. Throw in a tragic love story in the back drop of a few monuments that exude history, and you know that you are in for a treat. We took a trip to Mandu, many a monsoon back, but the varied hues of green meeting the grey horizon still remain fresh in our minds. 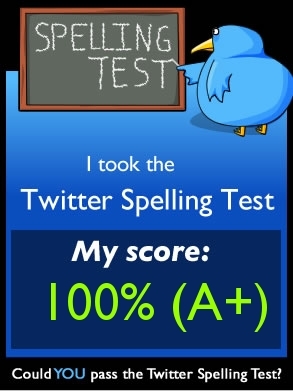 This is a guest post by Rajesh containing excerpts from a post by him published elsewhere. She was an ordinary village girl, extraordinarily beautiful and blessed with a divine voice. He was a Sultan, handsome, a lover of music and poetry, and content in his small fort kingdom up on a hill. He heard her singing by the riverside on his way back from hunting one day, and asked her to join him in his palace. She agreed but laid out one condition – the rive Narmada was her goddess and she couldn’t bear to live without seeing and worshipping her. The Sultan consented to build her a pavilion at the edge of a cliff, next to his own palace, so that she could watch the river flowing down in the valley. When the clouds loomed over the hills and the plains, she found it difficult to see the river and would not eat a morsel till she sighted it. One night, the river goddess visited her in her dreams and told her to dig a tank near her quarters. When this was done, the holy waters come surging up and filled the tank. The queen was ecstatic and lived contentedly with her beloved, till… the dark clouds of a cruel fate gathered over their idyllic land and lives. A powerful emperor sent his merciless general who vanquished the Sultan causing him to flee the kingdom. But before the general could seek out the beautiful queen and make her his own, she chose to die a brave and honourable death by consuming poison. As we walked up the leafy country lane, spellbound by the tragic tale of Rani Rupmati, we saw the pavilion rise up like an apparition in the distance. In a natural frame of dark, looming rain clouds, it was hard to imagine that the Rani was not up on the terrace, gazing at the eternity of the Nimar plains. 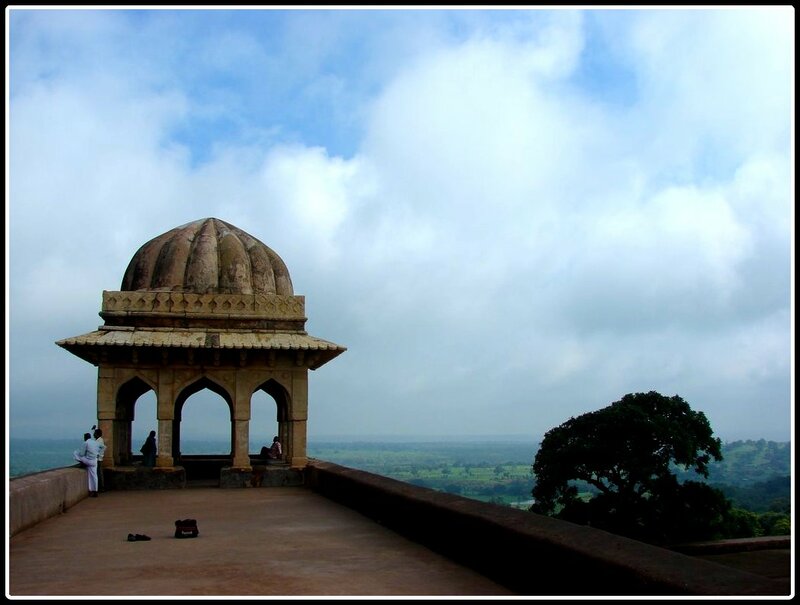 Looking at Rani Rupmati’s pavilion on that misty morning, we knew we were in a lost world of romance and tragedy – Mandu! I first read about Mandu in a bold, confident ad that seemed to hold its own among others that smacked of marketing disingenuousness. The reason? The monsoons had just begun, the time of the year that the tourism industry loathes. But the Mandu ad stood out in its honesty, proudly inviting anyone with a love of heritage, and a love of…well, love itself. But it took a few more monsoons for us to make that trip. Not that we had forgotten Mandu. For one, the visions conjured up in my mind of a fort city shrouded in eternal mist was hard to fade. And, the poignant love story of Rani Rupmati and Baz Bahadur was one that moved us to see its setting for real. We arrived in Mandu on an August evening when the mist hung heavy in the air and droplets of rain alternately fell and held back in pure indecision. As the climb began from the plains off Dhar, the road became narrower and less crowded. In an hour of taking in the countryside from the growing altitude, the first signs of reaching our destination spread out before us. We were crossing the Kakra Khoh ravine. 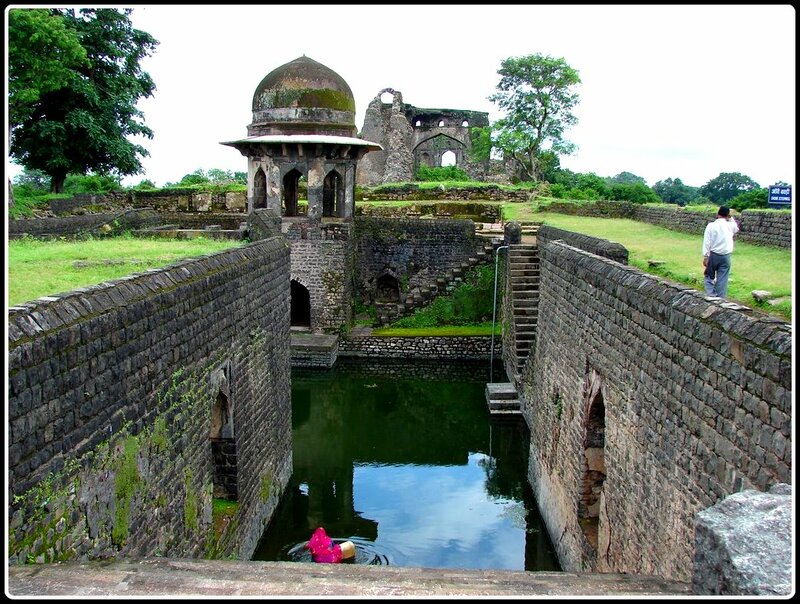 The deep gorges on either side helped navigate us forward and, soon, the Alamgir gate saw us into the age-old township of Shadiabad, the city of joy, modern day Mandu. 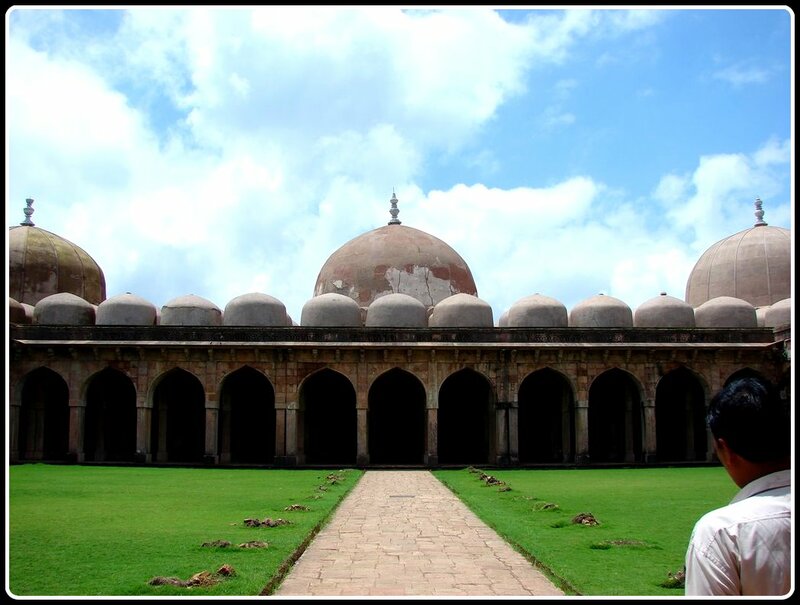 Even in the failing daylight, the silhouettes of Mandu’s icons seemed to tell their tales. Incidentally, the heritage spots here are divided into 3 zones – the Royal Enclave, the Central group and the Rewa Kund group. 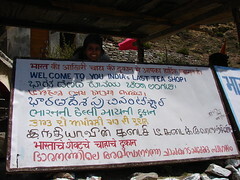 The MP tourism resort we were booked in was near the Rewa Kund group. With the day almost over, there was just time to catch up on the remnants of a tranquil Mandu evening by the lake next to the resort. The next day would be a pleasantly long one – and we had an appointment with some of the characters of that old story. Early the next morning, we thought it best to invest in a guide and set off to unravel the mysteries of Mandu. In about twenty minutes and a rendering of the tale, we were standing before Rani Rupmati’s pavilion. At the southern end, near the edge of the hills that fall down over 300 m into the valley below, the Queen’s pavilion looks more like a vision. 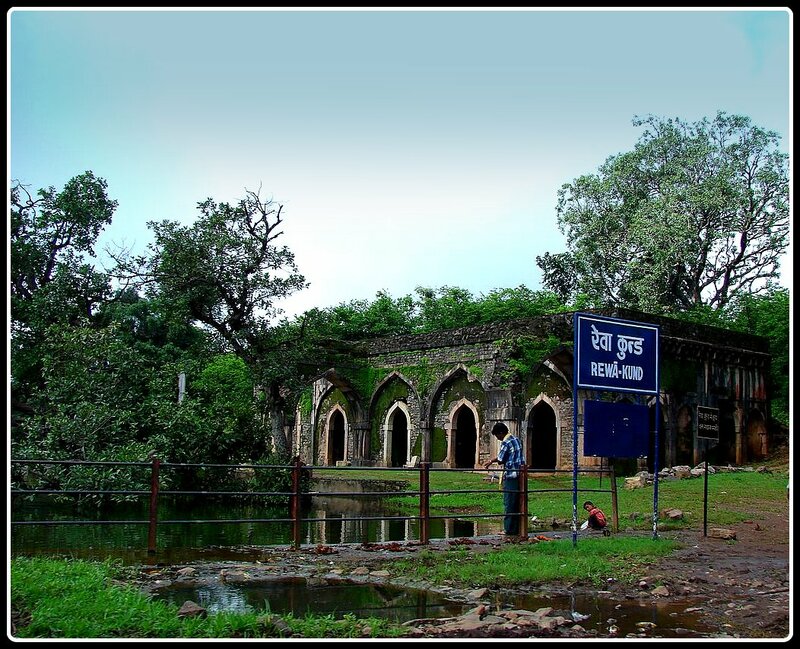 Originally built as an army observation post, two square pavilions with hemispherical domes were added for the queen – to look out at the Narmada flowing in the Nimar plains on the south, and her king’s palace on the north. From the top, the view is sensational – as though an oil painting were hung from the skies. As far as the eye could see, the plains that were swathed in a rainy film spread out forever, with the Narmada appearing to be more a meandering stream than the great river it is. We climbed down and walked over to Rewa Kund where an aqueduct from the Narmada sanctifies the reservoir that once united Rupmati with her goddess. The reverence continues to this day. 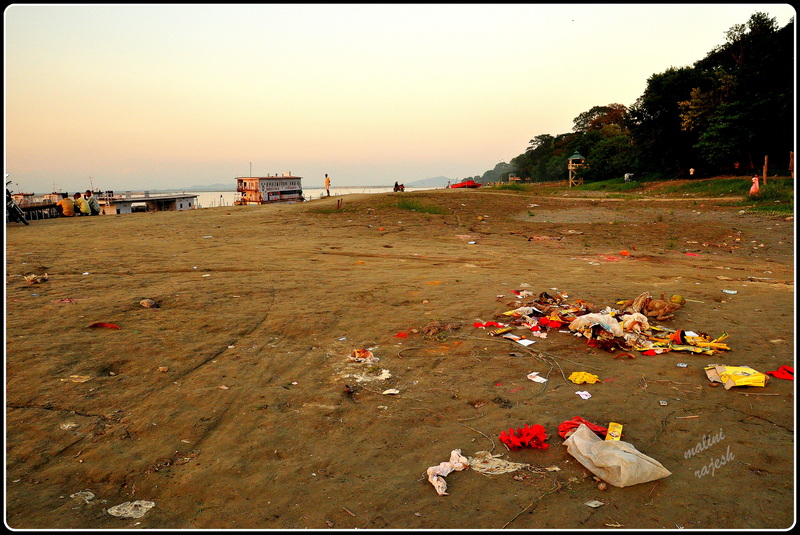 A complete parikrama of the Narmada is said to take 3 years, 3 months and 3 days, culminating in a dip in Rewa Kund. A little way ahead, Baz Bahadur’s palace is clearly a shadow of its once glorious past. A large court with a dried-up fountain adorned the middle as halls spread out on all sides. These were, besides the king’s personal spaces, also used as meeting points for the public and court officials. We drove back and stopped at Echo Point for an amazing demonstration of 15th century acoustics in today’s age. Useful, indeed, to convey critical news like the advent of an enemy’s army or the birth of a child. 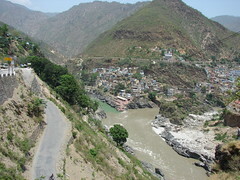 Towards the west, at the edge of a steep gorge is the Hindu shrine of Nilkanth. 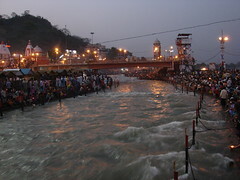 Pilgrims flock to witness the sight of a stream that flows in into a sacred pond around which a Shiva temple now stands. An example of the strong secular fabric of the times can be seen in the remnants of a palace built by Emperor Akbar for his Hindu wife. On the way back, a strange single storeyed structure, with arches leading into small cells, caught our attention. 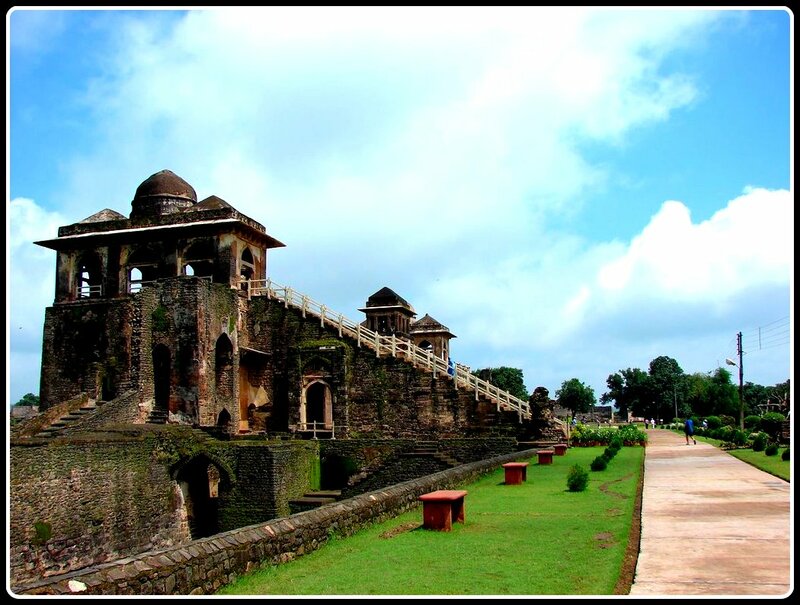 This was the infamous Chor Kot – the central jail of Mandu where the villains of the times cooled their heels! We parked outside the Jahaz Mahal and looked in awe. The building looked like a grand ship ready to sail. A museum containing a wide range of ancient sculptures stands at the entrance. All of 120 m in length, Jahaz Mahal is a double storied structure that seems to float between Munji Talao and Kapur Talao. A veritable pleasure palace, this was where Sultan Ghiyasuddin Khilji ruled and lived with his large harem of 15,000 women. Such was the irresistible charm of Jahaz Mahal that even Emperor Jahangir couldn’t resist residing here with his queen, Nur Jahan. And the view from the top gives you an all-encompassing vista of the entire Royal enclave and its rich heritage. Just beyond, the Hindola Mahal stands in all its uniqueness. Considered an architectural masterpiece, the swing palace gives the impression of the inwardly sloping sides swaying. The perfect setting for a Sultan to hold his durbar. Adjacent to the Hindola Mahal is the Champa Baoli, an architectural marvel that is a network of underground vaults connected to a specially constructed well provides for hot and cold scented water for the inmates of the mahal. The royal hammam, more a sauna bath, gives a glimpse of the sophistication of the times. A short walk away in the enclave is the cluster showcasing two more wells, the Ujali and Andheri baolis. Another attraction is the Nahar Jharokha which boasts of being the spot where Jahangir was said to have conferred on Prince Khurram the title of Shah Jahan following his victories in the Deccan. 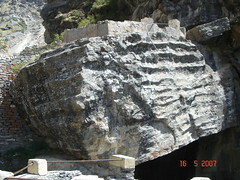 A unique, though crumbling, structure is Gada Khan’s shop, the departmental store of the times run by the wealthy and adept merchant, Gada Khan who supplied all materials from the sultan to the masses. From the royalty, we moved back – to the Central group, with its equally impressive monuments. Inspired by the great mosque of Damascus, the Jami Masjid with its perfectly proportioned domes arrest you in its simple magnificence. As we walked up to an imposing court, the architecture blossomed in the huge colonnades with its myriad arrangement of arches and pillars that spread out in effortless symmetry. Behind the Masjid stands the building now famous as the structure that moved Shah Jahan to model the Taj on. 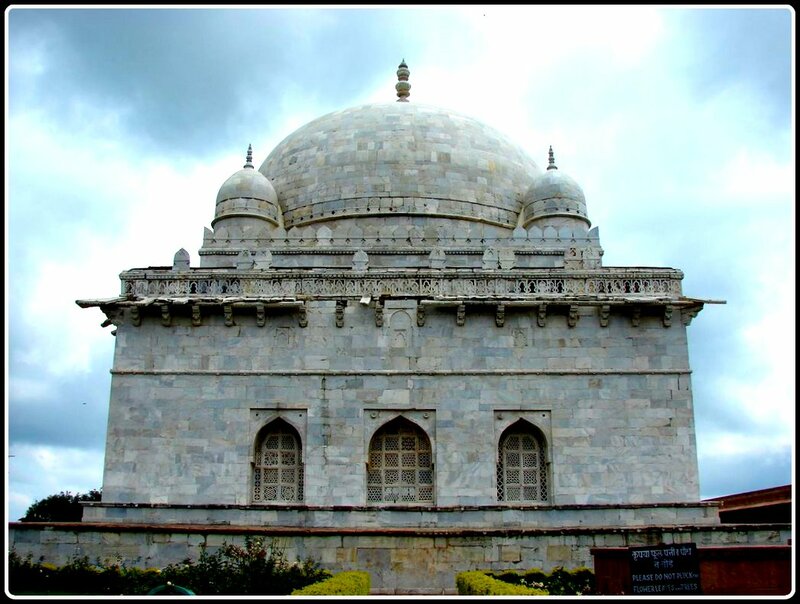 Housing Hoshang Shah’s tomb, this is the first marble edifice in the country, modeled on classical Afghan architecture. It’s hard not to find parallels here with the Taj right from the perfect domes, the intricate lattice work and the four towers that mark the corners. Inside, it was just deathly silence and the tombs of the Shah and his wives. In this ancient world, what could be older than these forts themselves? 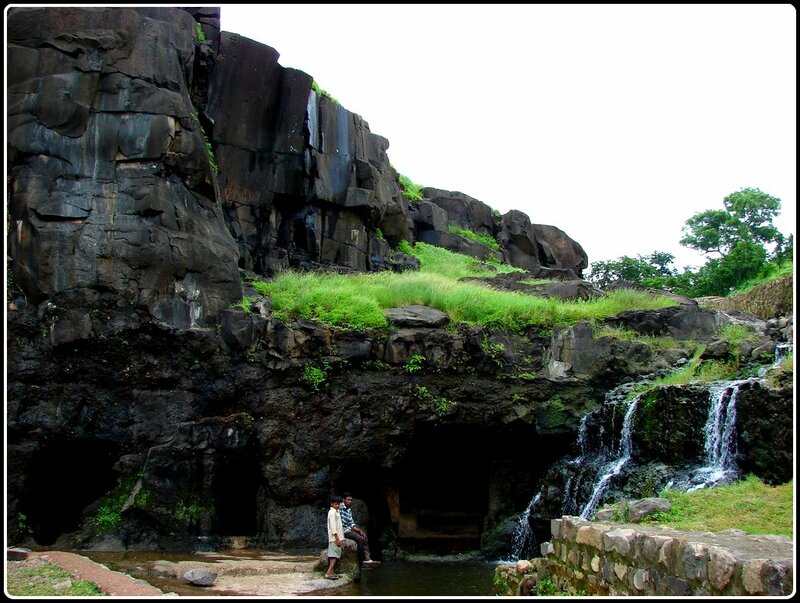 Not far from the royal enclave lies the answer – the Lohani caves that date back to the 11th century AD. Overlooking the expansive valley, the caves are cut out of the rock face and were, supposedly, used by yoginis as shelter. A cistern filled with flowing water has to be negotiated to reach the cave’s entrance. Stone carvings and sculptures excavated from here now are preserved in the museum next to Hoshang’s tomb. 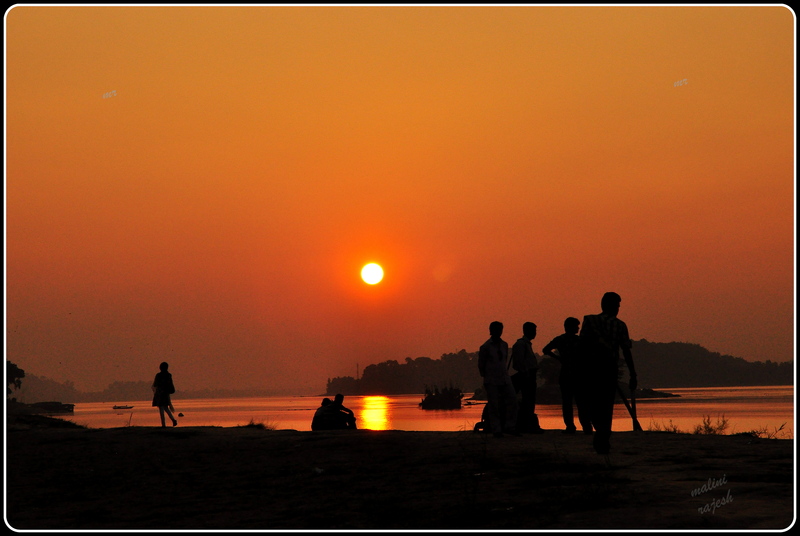 Above, there is a sunset point that offers the best of sundown sights in the city of joy. Despite spending a day in Mandu and gorging on its wealth, there were still stray jewels lying all over that we hadn’t yet seen. With the guide having done with his day’s work, we set off for some sightseeing of our own. Nearer to our resort, we walked past the thick baobab trees and buzzing villages towards a smattering of interesting monuments at Sagar Talao. 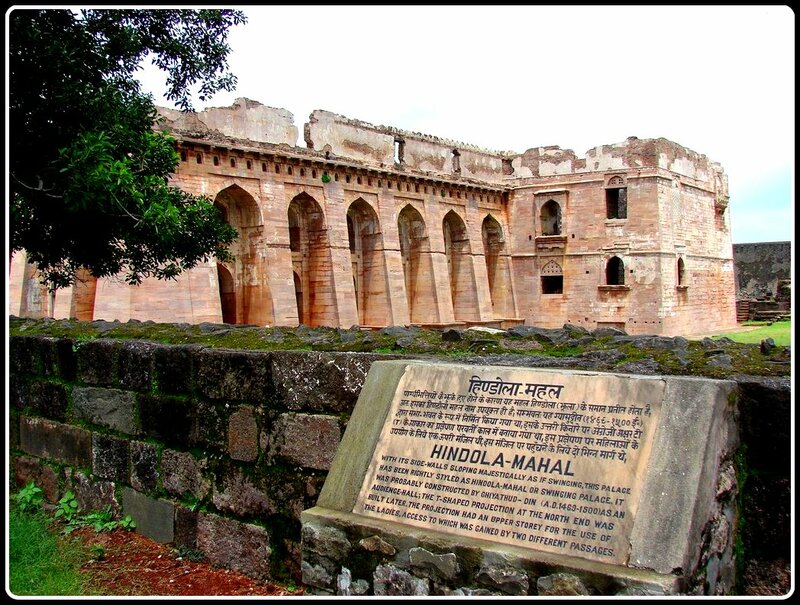 The Dai ka Mahal used to house the wet nurses of the day; the Dai ka Chhotti Behan ka Mahal nearby; the pleasing contours of the Caravanserai with its many rooms for the traveller of the times; the Hathi Mahal to house the hordes of elephants. With the failing light of the setting sun falling like a curtain on the sets of a historical play, we staggered amidst the ruins of this ghost town caught in an eternal time warp. The next morning, we were packed and on the road again early. The monuments on the Western Zone sat by like tired, old women clumsily draped in a white cloak of fog. 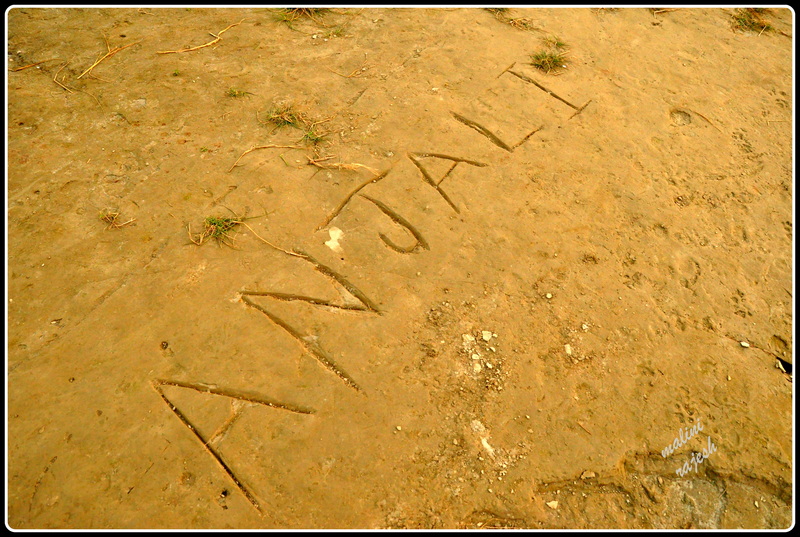 The Royal Enclave seemed to be stirring awake and the Jahaz Mahal beginning its drift to nowhere. 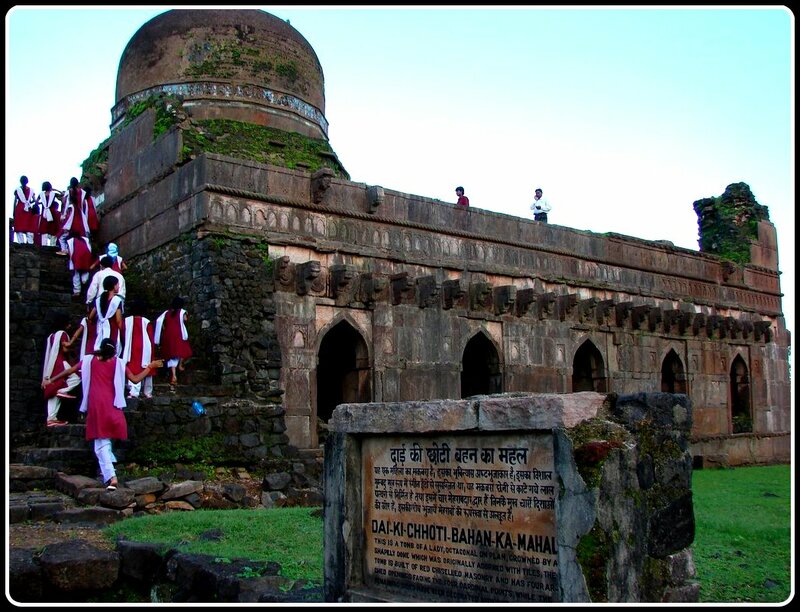 As we exited the Alamgir gate, it was only clear why Mandu is considered poetry in stone, a celebration of love. 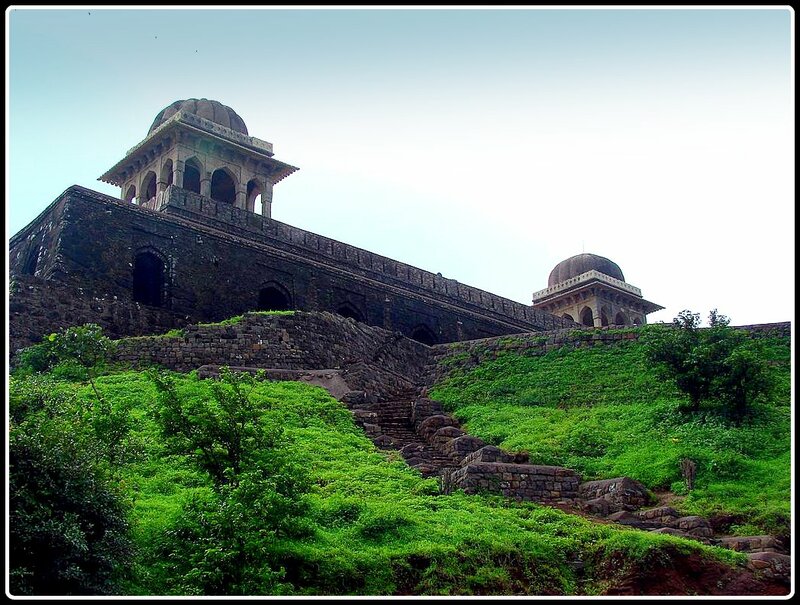 Passing through the verdant Vindhya range, the sun had come out on the hillsides, leaving behind Mandu in a permanent, heavy mist. And in that surreal world lay the inscrutable mysteries of a dreamland – complete with a beautiful queen, her besotted Sultan, a song of life and an elegy of death. Mandu had kept its promises. It’s one of those journeys that takes you to that lost corner of the heart that is just waiting to be discovered. 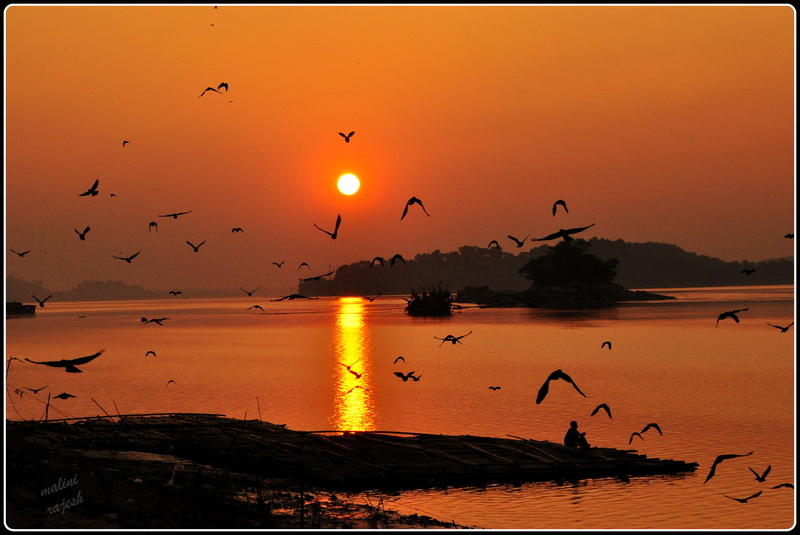 What would you do if you had only an evening in Guwahati? 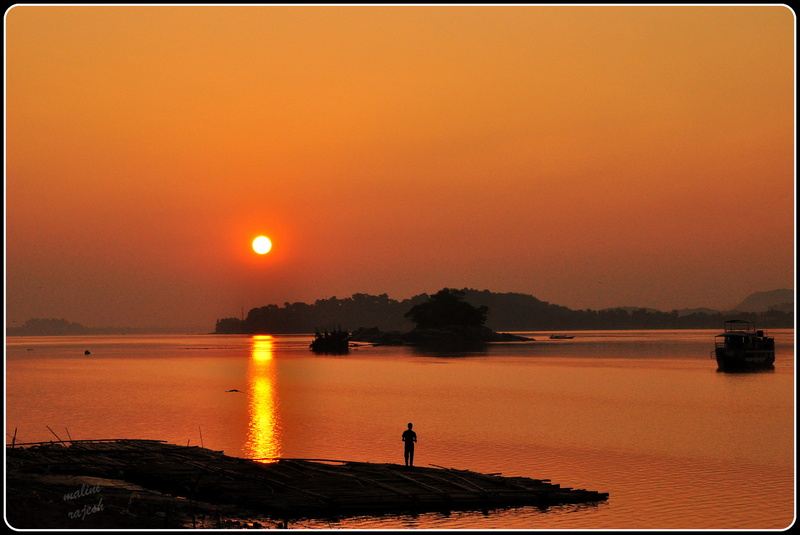 Spend those precious hours at the expanse of the calm and unhurried Brahamputra. That’s what we did. We were at the fag end of our 21-day sojourn through the north eastern states. We were in Guwahati for just a night before catching our flight back home. From the hotel we hailed a rickshaw and said “Ghat”. Looking at us and seeing that we were not locals he raised his eyebrow and said “Suruj “. 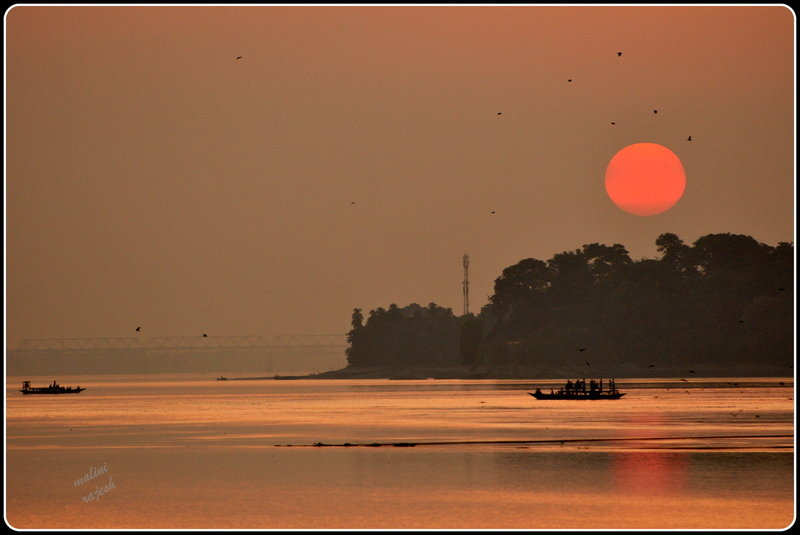 Yes, we wanted to see the famed sunset on the Brahmaputra River. We were dropped at the Fancy Bazaar Ghat. A few boats were anchored to the shore, swaying to the lullabies of the waves. A few others, probably the last ones of the day, were trying desperately to get back to the shore. It was only 4.30 pm, but the sun was already down to its brightest red. The river completely mesmerized us. Not only with its beauty, but also with its sheer size and huge expanse. How can you call something so vast like Brahmaputra, a river? Brahmaputra looked more like an ocean – a moving one. It’s so different to sit by a river, who is addressed in the masculine gender. Brahmaputra, Son of Brahma, the only ‘Nad’ (नद) in India. You get a different kind of vibe from ‘him’; you can feel the strength and energy, the hidden danger lurking inside the depths, often expressed when he comes to full strength, during monsoons. Brahmaputra is the life line of Assam. More than the religious importance, this river evokes a sense of pride in the people. At the same time people have suffered when the river has come full throttle. We walked along the banks to get a better view of the sun. The banks were not without the usual share of the city’s grime. Did we hear a silent scream? “Clean me and preserve me for posterity”. 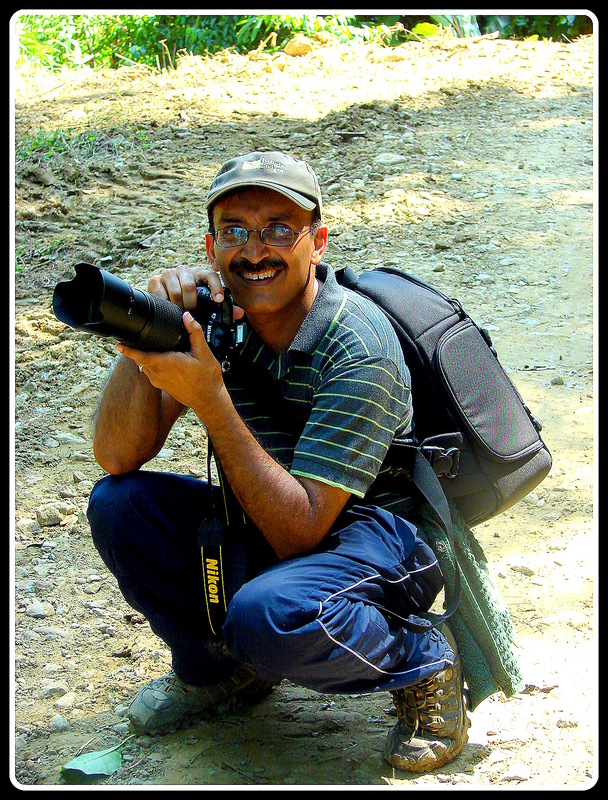 Did we miss his pain in our relentless effort to capture one of his golden moments in our cameras. Was he calling to us silently, welcoming us to explore the deep waters. 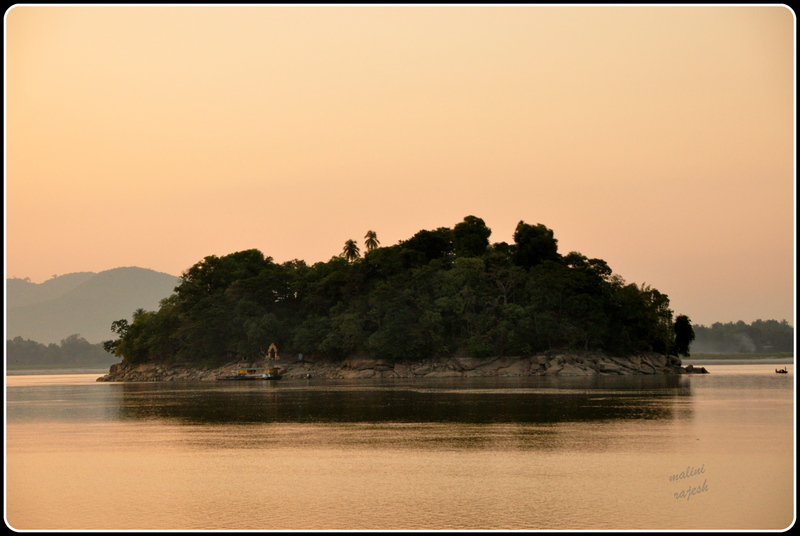 The smallest river island – Umananda Island – in his midst beckoning us to the shores. We didn’t venture in. Why does this river take many a name in its course, even if the water that flows through the river beds is the same. Originating as Yarlung Tsangpo from Kailash Manasarovar in Tibet, in Arunachal Pradesh, Brahmaputra is known as the Siang River. 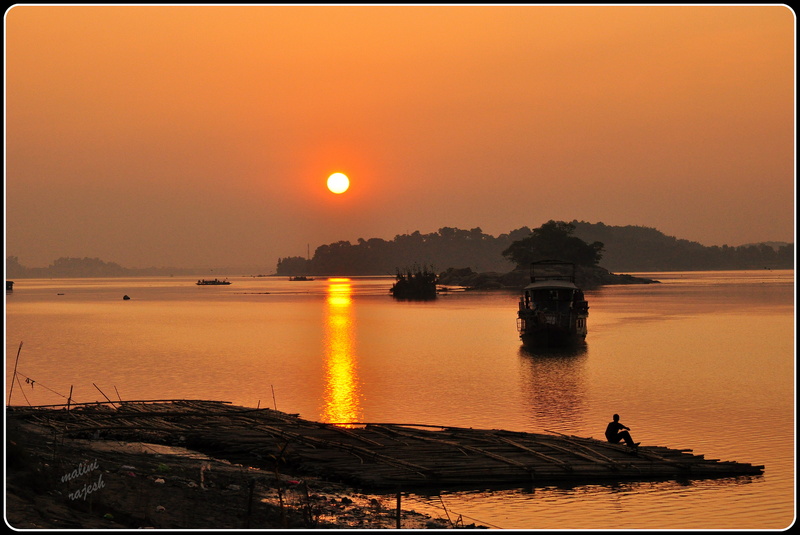 In Assam, Brahmaputra River is also known as ‘Luit’ or the red one. But what’s in a name, right? I could be anyone you would want me to be. It was finally time for our journey back to reality. 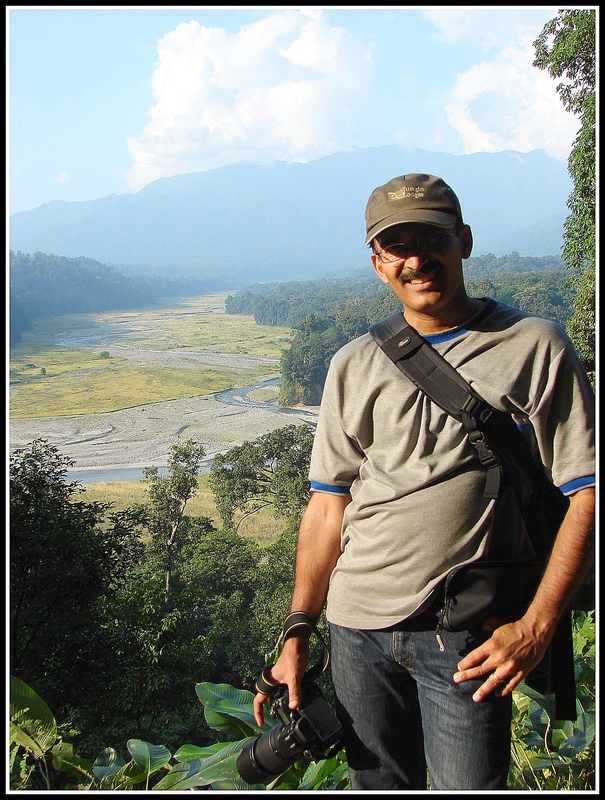 The magic of Brahmaputra was coming with us. Just like the music of Bhupen Hazarika, known as the bard of Brahmaputra, whose soulful renditions traveled thousands of miles beyond these shores. And as we flicked the sand off our clothes and made our way to a waiting rickshaw, we turned back for one more time to look at him. He didn’t let us down. Brahmaputra still glistened like gold in the setting sun.